My new favorite thing (again) is fly fishing. It was my favourite thing for a time when I was a a young lad, 8 or so. But I didn't ever really go fly fishing, I just collected the equipment and read Field and Stream and took a fly-tying course in a Peterborough strip mall with some old men. 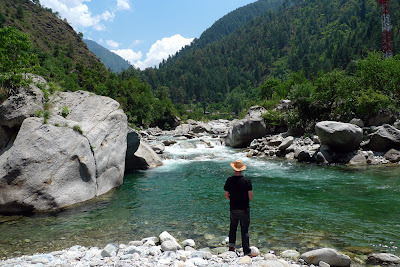 So actually going fishing for three days on the Tirthan River in Himachal Pradesh was a real thrill. The weather was a little ugly but the valley was beautiful and the fishing was great fun, but also serious. There is something very serious about fly fishing. 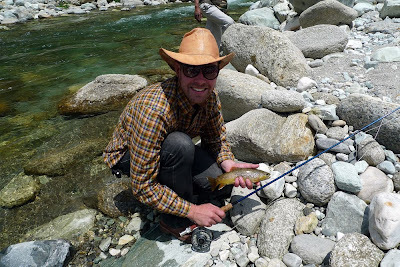 The Tirthan, and other rivers across appropriate terrain in India, contain salmo trutta, Brown Trout. 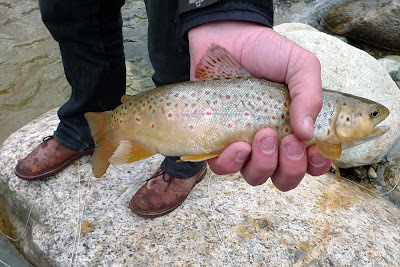 They're not a native species, but they've lived in the mountain streams and rivers for a hundred years or more- they were stocked by the British. 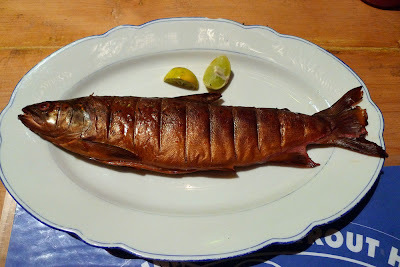 "Wherever the British army went, there are trout," our host Christopher told us. (Such an aquacultural feat amazes me - how did they manage to transport the fry, keep them at the appropriate temperature, etc...?) Over two thousand years earlier, Alexander the Great's army inhabited these valleys as well. Day One saw us rent one fly rod, and start off at an easy spot to cast, where I hooked a decent sized fish (10 inches is a keeper) but lost it on behalf of a poor landing effort. As the afternoon progressed, I noticed Mel getting a little frostier. Not cold, but bored. I realized I hadn't been sharing the rod very well. Maybe at all. We decided to rent two rods the next day, and hire a guide, in hopes of more fish. I read Way of the Trout at night, voraciously. The next morning we were still very much "finding our rhythm" with the line which accounted for many lost flies. 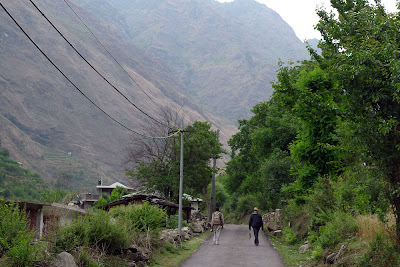 After we had lost 10 or so, I asked our faithful guide Deepak how much the flies cost. Maybe wondering if the bill would come through to us. He said they were 200 Rs - $5 each. This could get expensive, we thought. I did manage to hook into a keeper male, which we decided to have for dinner, smoked. 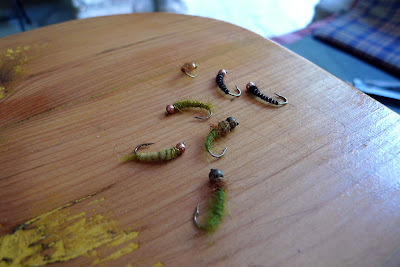 At lunch I decided to tie a few flies, mostly to save us the expense of losing them. My skills were rusty since my Ptbo days - I broke the vice - but I managed to produce a few passable weighted nymph imitations. In the afternoon, I managed to hook a nice little trout on one of my flies. I can't believe it actually worked. Who knew. It was a handsome feeling. Day three was two rods and no guide. Still going through many flies but I was starting to feel the whole thing out. I only caught a tiny trout, but Mel caught the fish of the day (on another one of my flies) as the sun was going behind the mountains. I was glad for her. 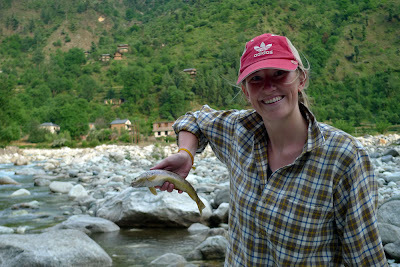 If you're ever in the neighbourhood, I highly reccomend a stay at the Himalayan Trout House. 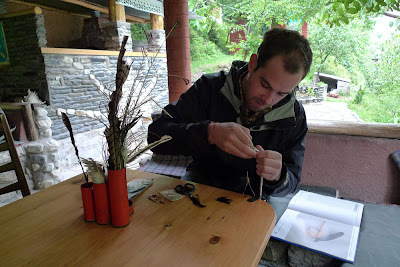 Great food, atmosphere, and fun in a remote mountain village setting. We were only charged 150 Rs for all the lost flies. All in all, a magical three days for me and another obscure and expensive hobby, refound.